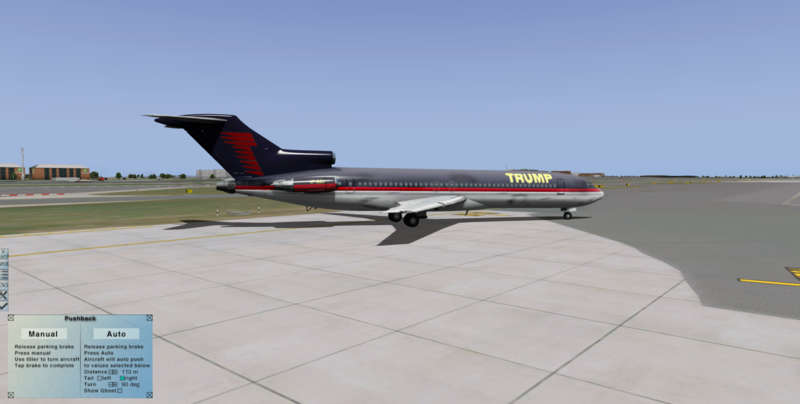 This review contains screenshots with the livery of the Trump private jet. We would like our readers to know that this does NOT mean we are sending political statements. SimReview.ca will NEVER send political statements through our website. We just selected this livery because of the options and also to show that the 727 can, in fact, be used as a private jet. The Boeing 727 is a mid-size narrow body trijet built by Boeing between 1962 and 1984. It has a range of up to 2700nm, and can carry 149-189 passengers in a 3-3 configuration, similar to the 737. It had the distinct advantage of being able to use short (and also unprepared) runways at regional airports. It originally had three PW JT8D engines below a T-tail, with the central engine connected via an S duct to the base of the tailfin. This made it Boeing’s only trijet aircraft. It was one of the first second generation jetliners, following directly on from the quad engine 707, and has the same cross section and cockpit design. The 727-100, the smallest version entered service in February 1964, with the stretched 727-200 following in 1967. It was a common plane throughout the 70s and 80s, although flying numbers have now decreased to just 109 aircraft, primarily due to noise restrictions. It was launched by Eastern Airlines, which was followed by American and United, and 1932 were built. This number was only surpassed by the 737 in the early 90s. The aircraft comes as a single .zip file. Within this, you will find the aircrafts folder, which must simply be moved to your X-Plane aircraft folder (X-Plane root)/Aircraft/Boeing/727 in my case. After installing this, you are ready to fly. As a side note, FJS do offer a CIVA navigation system, which is designed to replicate the system found in early 727s. The only difference with this in version 2 is the ability to use the CIVA as a 3-D model, rather than just a 2-D popup. The modelling is good, however as with the 732 and original B727, I do wish there was implementation of the rear air stairs, as they are one of the core features of the 727. 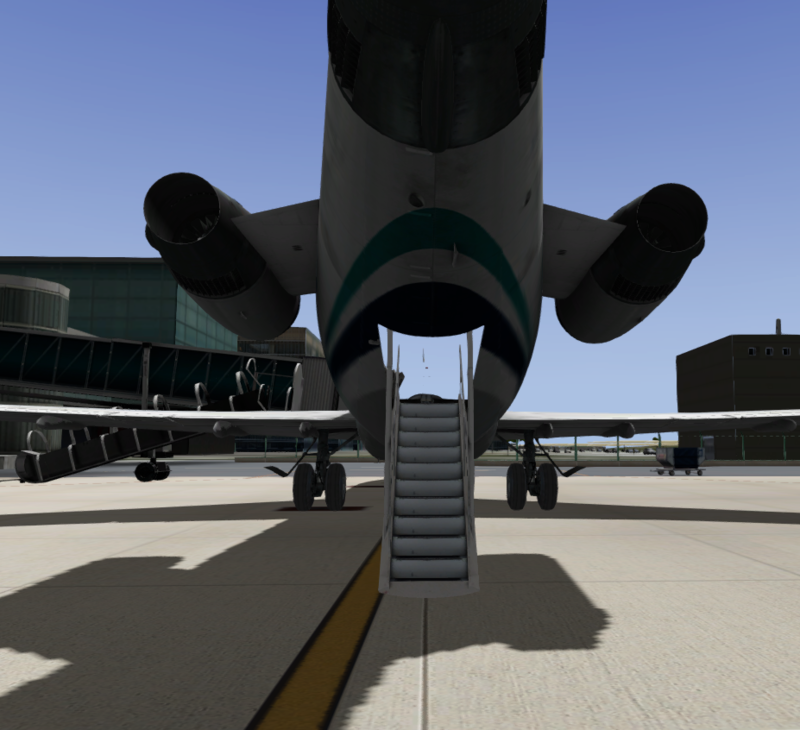 The stairs are implemented, although as there is no cabin, they simply have hollow walls. The gear and flaps have been modelled brilliantly. The aircraft comes with the JT8D engines, which look astoundingly good. The exterior model has not been changed in the V2 upgrade, only the implementation of new features. One thing FJS has always done well is the cockpit, and the 727 is no exception. The forward panels look unbelievable, and are properly weathered for a 50-year-old plane. The reflections can be found on every piece of glass on the plane, including instruments such as the radio altimeter and Air temp gauge. The biggest fault I could find was in the shadows of the screws at the bottom of the yaw dampener panel, and this is by no means important. 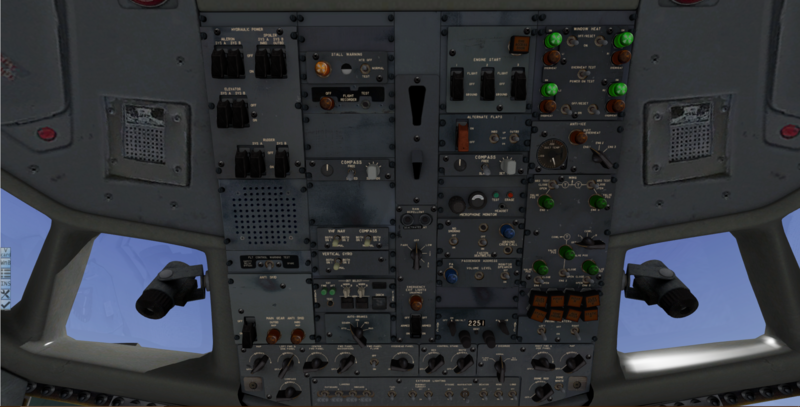 However, as with all of the FJS products so far, a large number of the switches in the cockpit look too generic, and out of place for the 727. An improvement for the future would be to focus more effort onto modelling better switches, as developers such as IEXG have done. The aircraft does not come with any ground handling trucks. 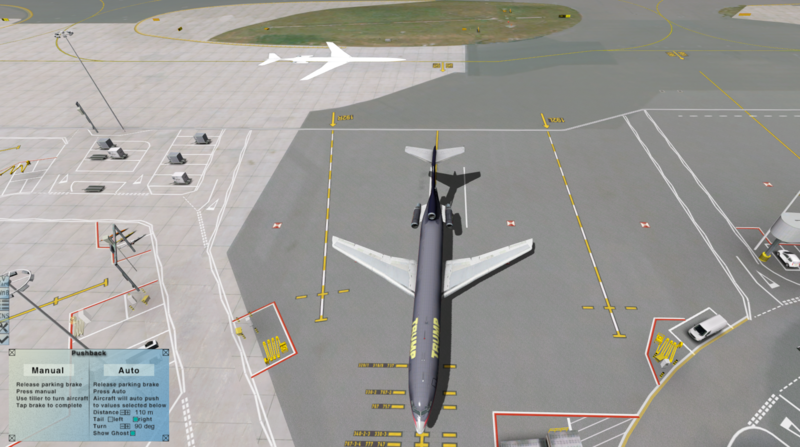 It does however include a pushback system with a “ghost” image, which allows you to see where the plane will push back to. The aircraft does also include GPU and air conditioning truck, although there are no models for them. This causes me annoyance, but can easily be overcome by using JAR ground handling, which includes a truck by default. The biggest downfall I see with the plane is its sound. The engine startup sounds cut off abruptly, and cockpit sounds are far too generic for a high quality aircraft. One of my favorite features of the new version of the plane are custom failures, which are very much realistic. Dependent on your handling of the aircraft, certain failures may occur, such as engine fire and jammed flaps. This has happened to me on many flights, and gives you as a pilot an incentive to fly the plane to the book. Finally, FJS have included a 3D and 2D X-FMC in the aircraft, to assist with navigation in places such as Australia and Europe, which are slowly turning off their physical navaids. This can be useful, although it’s calculations for climb and decent, as well as takeoff speeds can be far from what they should be. There is a V speeds calculator included in the aircraft, which is very much accurate, and one of the nicest features of the plane. 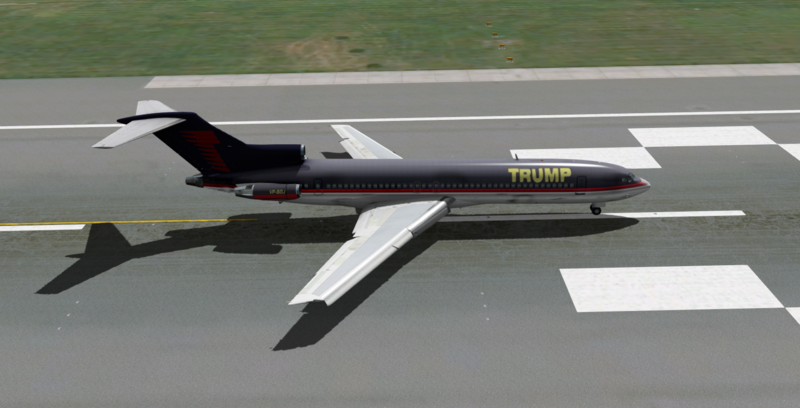 In this case, we will be taking a flight aboard Donald trump’s former private jet from EGLL (London – Heathrow) to EGCC (Manchester), which should take around a hour. From our parking position at Terminal 1 (which, as with the 727 is now being replaced by a more modern and expanded terminal 2) The aircraft has been left in a turnaround state, allowing for a smooth turnaround on the way to Manchester. With the walk around complete, we have just enough time to check that no maintenance is required for the plane, before planning our departure. XFMC is simple to set up, requiring just a departure, arrival and cruise. To insert the route, you can just use your keyboard, which is a nice touch. We will take the WOBUN3F departure from runway 27R, and cruise at FL160. 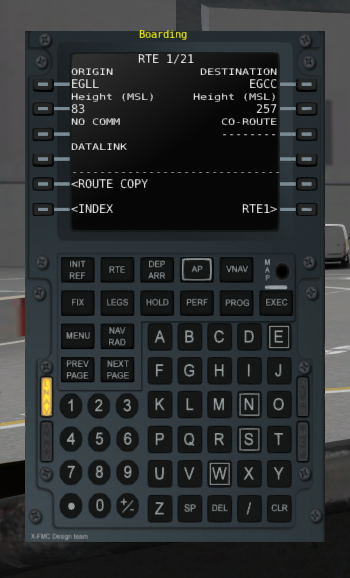 This style of FMC isn’t awfully realistic to 727s, but it does make it easier for new users to navigate. With the engines started, we are ready to push back. 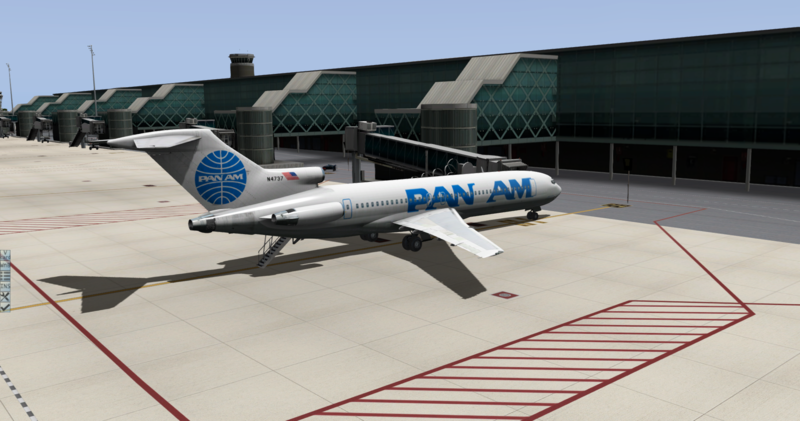 Using the pushback menu, which is activated by clicking the “ground call” button on the overhead, you have the option of either a manual pushback, using the nose wheel tiller to navigate, or an automatic push to an assigned location. I flew to plane to 5000, before sending in the autopilot. The aircraft is very smooth to fly manually, but you do have to be careful with your speeds, and be gentle in rolling it, for it is very easy to find yourself in a stall, which is rather difficult to get out of. The autopilot is basic, as you would expect in a 70s plane, and has no auto throttle. As a side note, to make the aircraft level off at a set altitude, choose the altitude on the main panel, then head down to the autopilot panel and click ARM, which will make it work correctly. I did however have some issues with the aircraft leveling at about 300-400ft above the requested altitude. The 727 is one of those planes which you can’t really just leave alone, and go to sleep. There are all kinds of things that easily go wrong, and as there is no auto throttle, the speed needs constant checking. That being said, it makes for a more interesting experience. The aircraft descends and climbs well. When descending you need to be careful not to take flaps too early, as they cause large amounts of drag. In addition, unless absolutely necessary, I suggest no more than flaps 2-30, as flaps 40 makes it very easy for the aircraft to stall. It is important on approach to keep the speed above the minimum speeds. It is a very smooth plane to land manually, and a joy in general to fly, although you will definitely need a joystick or yoke to fly the plane easily. The FJS 727 was already a good plane before V2, although it’s systems were lacking. This has definitely been corrected in V2, and is one of my favorite of the older aircraft. It has a steep learning curve, although there are ways to make it easier for new users, by turning off failures. Improve the sounds, especially engine ones. This review is written for SimReview.ca and published by SimReview.ca.